With the new power supply series LCM-40 and LCM-60 MeanWell expands its wide range of switching power supplies for LED lighting. The basic models LCM-40 and LCM-60 from MeanWell feature the "3-in-1" dimming function (0...10V DC, PWM signal). MeanWell's LCM series is suitable for input voltages of 180...295 V AC, has a two-stage PFC filter and complies with EN61000-3-2 Class C (> 35% load), which is important for lighting technology. Up to ten LCM power supplies can be grouped via a separate output, allowing synchronized dimming of multiple luminaires. Other features of the MeanWell switching power supplies are the class II design (no FG), a built-in 12V/50mA auxiliary output (e.g. for fan, not available with LCM-25), short-circuit protection, overvoltage protection and overtemperature protection. 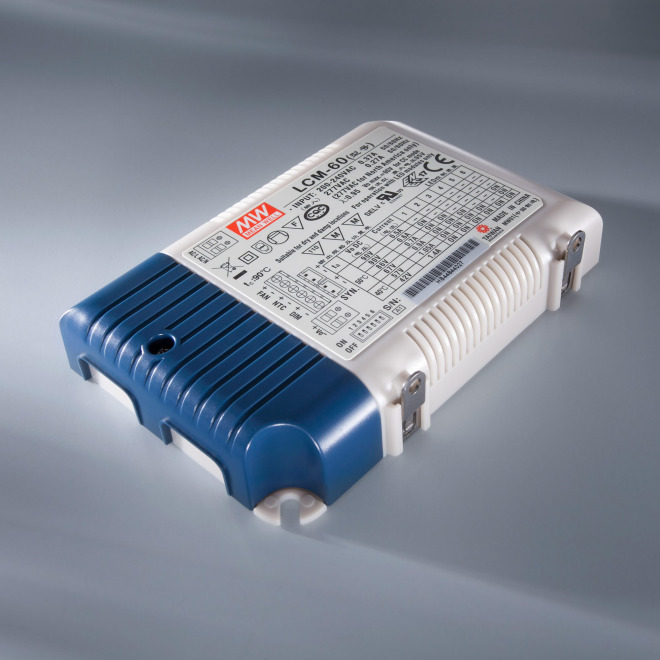 All MeanWell LCM Series switching power supplies comply with UL8750, ENEC EN61347-2-13 and EN62384. Typical applications include commercial LED lighting, office lighting, LED deco lighting.